Ghosn responds to a question on the alliance's new venture capital fund at the CES. Renault, Nissan and Mitsubishi confirmed they will invest as much as $1 billion to fund mobility startups over the next five years as the alliance looks to make inroads with new technology at a time of rapid upheaval for the transportation sector. The carmaking partners will invest as much as $200 million during the venture capital fund's first year, the alliance said in a statement Tuesday. The fund, called Alliance Ventures, will finance new developments in electrification, autonomy, connectivity and artificial intelligence. It is set to be largest corporate venture capital fund in the auto industry over the period until 2022, the companies said. The traditional auto industry model based on individual ownership is threatened by pay-per-use services such as Uber, as well as ride- and car-sharing platforms, a challenge heightened by shifts towards electric and self-driving cars. "The way we're organized now is not sufficient," Carlos Ghosn, alliance chairman, said in a Bloomberg Television interview at CES in Las Vegas, citing a need for the creativity of startups and outside partners. "I don't think we can do it alone." Its first strategic investment will fund Ionic Materials, a U.S. company, developing cobalt-free solid-state battery materials that can be used in electric vehicles. The alliance announced in September plans to introduce 12 new EVs by 2022 while extending range and slashing battery costs. The fund's formation follows similar moves by competitors, including General Motors' GM Ventures, BMW's i Ventures and Toyota's Toyota AI Ventures. 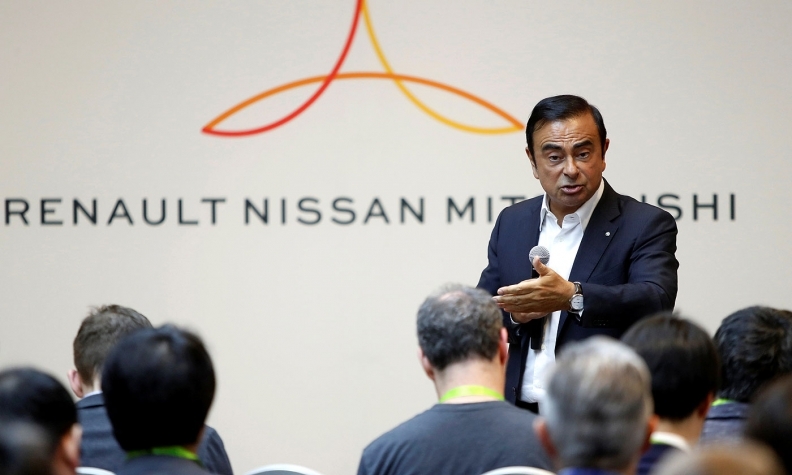 Renault and Nissan will each fund 40 percent of Alliance Ventures -- which will be co-located in Silicon Valley, Paris, Beijing and Yokohama, Japan -- while Mitsubishi will contribute 20 percent. The plan, reported by Reuters last week, calls for the automakers to establish the fund as a Dutch-registered joint venture. It will be headed by Francois Dossa, a former banker who led Brazil operations for Societe Generale and then for Nissan, the companies said. The venture capital investment comes in addition to more than 8.5 billion euros ($10.2 billion) in combined annual research and development investments by the three automakers.